Very recently I have been doing a lot of "push hands". What is "push hands"? Well to start with, I prefer Chen Yun-Ching Shifu's term for it - "listening hands". Other terms used include "sticky hands". 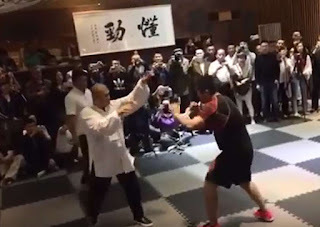 This is a form of 2 person training (a form of limited sparring, if you will) that is found in almost every traditional Chinese and Okinawan system of martial arts. Basically it involves setting up a rhythmical, cyclic sequence of movements with a partner. 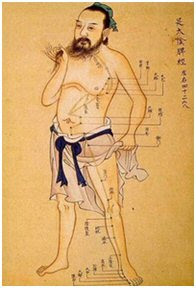 This cycle can then be interrupted at certain unpredictable moments with a technique - be it a push, a strike or a joint lock (qin-na). Accordingly it serves as a platform for applying techniques in a semi-free scenario; one where this a dynamic context (ie. one that occurs in the context of continuous movement) but not one that is totally unpredictable and chaotic. There is, instead, only one moment of "chaos" - the point at which you or your partner chooses to "break" the sequence with an unscripted movement. How you break that sequence and how your partner responds to that sequence depends on what happens next. Some schools have set movements - often quite elaborate - making up the sequence. Sometimes these movements take the form of "essence moves" that form the foundation of deflections, parrys and even strikes. 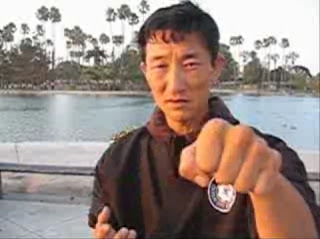 Examples can be found in the taiji sequence "peng, liu, ji and an" and in the various "chi sau" ("sticky hands") of wing chun (which feature deflections such as fook sau, tan sau, lap sau, bong sau etc.). 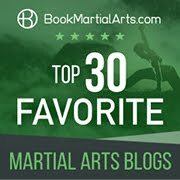 The concept in such sequences is that while moving through it you are mapping neural pathways important for learning the principles (and not necessarily the actual techniques) that underlie traditional fighting methodologies. Sometimes these drills are practised without any attempt to "break" the flow; their practice is in itself a means to an end. Most schools will however have some element of a "break". In some schools there isn't even a set sequence; instead practitioners will simply let their arms remain in contact while flowing around each other until someone makes an aggressive movement (ie. the "break" referred to above) - to which the the other person will then have to respond. This is usually called "freestyle" push hands or listening hands. Some schools will do both scripted and freestyle listening hands. But this still leaves unanswered the following question: why do this form of training? What function does listening hands have that cannot be achieved through other forms of training, be it sparring (free or restricted)? The answer, as I've foreshadowed, lies in sensitivity; "listening" to your opponent, learning how to "hear" every change in his or her movement through contact and responding to that change in a seamless, intuitive way. In this regard I often see various forms of listening hands (particularly Okinawan kakie) being performed with tension (ie. muscular resistance or exertion). This approach is, in my view, of limited value. Consider this for a moment: when you touch someone with the barest touch, your fingers lightly grazing the surface of their skin, you'll note how their body responds instantly. There is usually a "goosebump" effect and they react quite sharply. This is because the person's neurons are all "switched on"; they are all firing madly, volume turned up to the max to "hear" the signal. Conversely, if you grab hold someone's wrist or arm with great pressure their body reacts to deaden the nerves; ie. their response is dampened down. Why? Pain is the first, most obvious reason: if your neurons were all firing at full volume you'd be in a lot of bother. Second, your initial contact is well established; there is simply no need for the neurons to be as sensitive as when you are barely touching something. For example, when you are feeling your way through a darkened room, you want to know if you are about to make contact with an object, so your body is primed to sense every light contact. When firm contact is established, this imperative no longer exists. Accordingly, when listening hands is engaged with rough movement, muscular resistance and heavy pressure, your nerves are deadened to the point where the exercise becomes largely pointless (from a "listening" perspective anyway). When you touch very lightly on the other hand, your sensitivity is heightened and and you become aware of every little nuance in the movement. I believe that it is precisely for this reason that the basic model underlying all listening hands drills (and distinguishing them from other forms of limited sparring) is as follows: using firm but light contact, set up a looping rhythm - then break it. Why the "break" in rhythm? The purpose of this is a "test". Can you discern the change in time to react? And is your reaction productive? Conversely, can you make your opponent not "hear" your movement - ie. can you move so that your partner does not discern your intention - or misreads your intention? 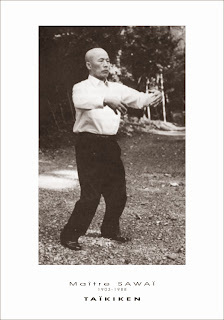 Some have argued that Okinawan kakie is not a sensitivity exercise so much as it is a platform for applying either the principles or the actual techniques of the art. Indeed, application-based drills are very useful. However I maintain that any form of "sticky hands" training is more than just a platform for application of techniques. It is a platform for reading your partner (and neutralising his/her attacks) - then successfully applying your own techiques. In my view this is the only possible purpose to setting up a rhythm which is then broken. "Rougher" goju kakie - note the fact that a rhythm still exists and is being "broken"
And almost every kakie/chi sau/push hands follows this concept. Even the gojuka doing kakie in the above video employ a rhythm which they then break. While I think this kind of "strenuous kakie" has its place (I've done it many times over the years), I don't think it quite matches the use (and breaking) of a rhythm; the pressure is, I think, a little too great for sensitivity training. And if drills like kakie are just a platform for techniques, you might as well just cross hands - or if you need movement, perform it in the context of a step in (ie. ippon kumite). Nor do I believe that other activities, notably grappling, displace push hands as a senstivity exercise. 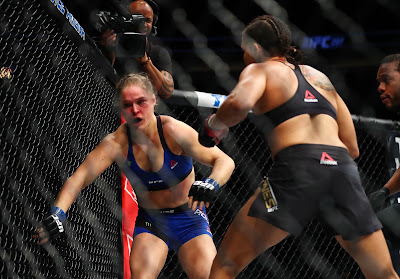 Some have argued that grappling provides a kind of "whole body" sensitivity, while push hands focuses on hand sensitivity only. My answer to this is that sensitivity to movement/change in your opponent occurs in the mind, not so much in the points of contact. Doing push hands with James Sumarac recently I was struck by how his whole body reacted to my movement, not just his hands. More importantly, while grappling teaches great sensitivity, it does not provide a systematic "sensitivity training drill". Rather you learn just by "just sparring". Push hands is, in my view, an opportunity to isolate and develop that sensitivity in the absence of other considerations. It should augment other technical training - it can't replace it. If I may I'd like to post a clarification to the concept of sticky hands that I've noticed in my training (or perhaps you might think of it as an expansion or simply another benefit of training the method). a) A platform for practicing techniques. 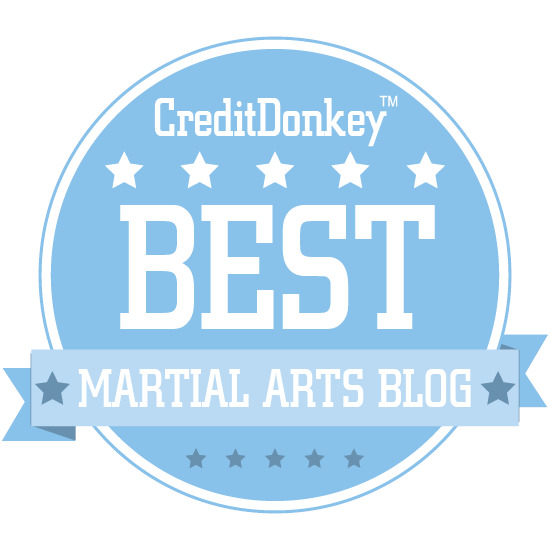 b) A platform for training sensitivity to the motions of your opponent. And you're definitely correct that (b) is an extension of (a), in that (a) is the most rudimentary thing you could practice in chi sao. It's certainly more productive to train sensitivity in addition to simply practicing technique. 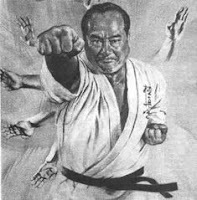 However, I want to add a (c) here, namely that chi sao can also teach you how to control your opponent, and not merely react to him. What happens typically is that, while running these dynamic drills, one opponent will try to dampen the motions of the other, thereby preventing him from moving. This type of response is double-edged, but productive. If you can successfully eliminate the motions of your opponent, he cannot react in time to defend his exposed areas. If you trap his arms low, his head is exposed, and vice versa. And if he responds incorrectly to the pressure, there's the added bonus that he will more than likely respond too hard in one way, allowing you to capture the energy from his force and use it against him. Controlled rolling is baiting your opponent to do something wrong, and capitalizing on the advantages of him doing so. But as you said, if you engage too much muscle strength, you deaden your nerves, and your opponent stands a greater chance of flowing out of your control and into a counter-attack. And your heightened energy might work against you in the exact same way it was supposed to work for you. And so a competitive dynamic forms in the rolling exercise itself, prior to any punches or techniques, whereby each practicioner is trying to establish the upper hand for himself. The punch, lock, kick, etc. becomes an afterthought - the more important victories becoming uncovered areas, loss of balance, trapped hands, turned bodies, etc. You spend 90% of your efforts to elicit these responses from your opponent, so the 10% effort of punching can end the encounter. 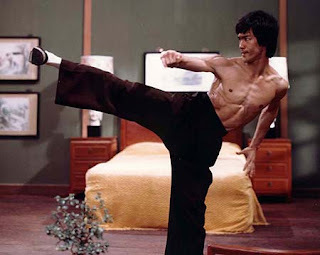 Nevertheless, chi sau can not merely be training to react to your opponent, but actually training to elicit a response from him. This is, at least, what we are taught is the highest level of the practice. It's also something that can never be tangibly observed in videos, unfortunately, only felt. 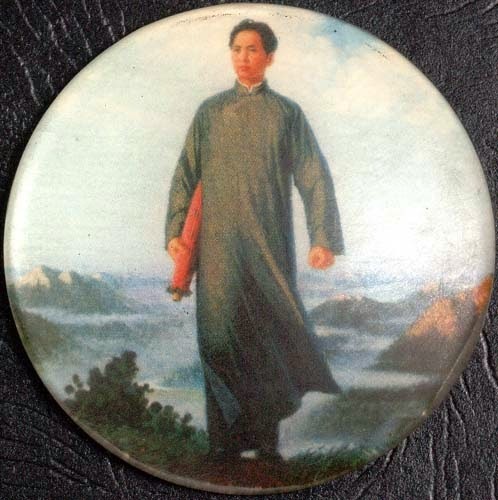 One of the better practicioners of chi sau trained with this intention is the Ip Ching lineage of Wing Chun, in case you were interested in a reference. Anyways, I thought it would be an explanation you might be interested in. Thanks for that - I concur with your remarks and find them very informative.